The migration characteristics of carbon nanotubes from liquid phase to vapor phase in the refrigerant-based nanofluid pool boiling were investigated experimentally. 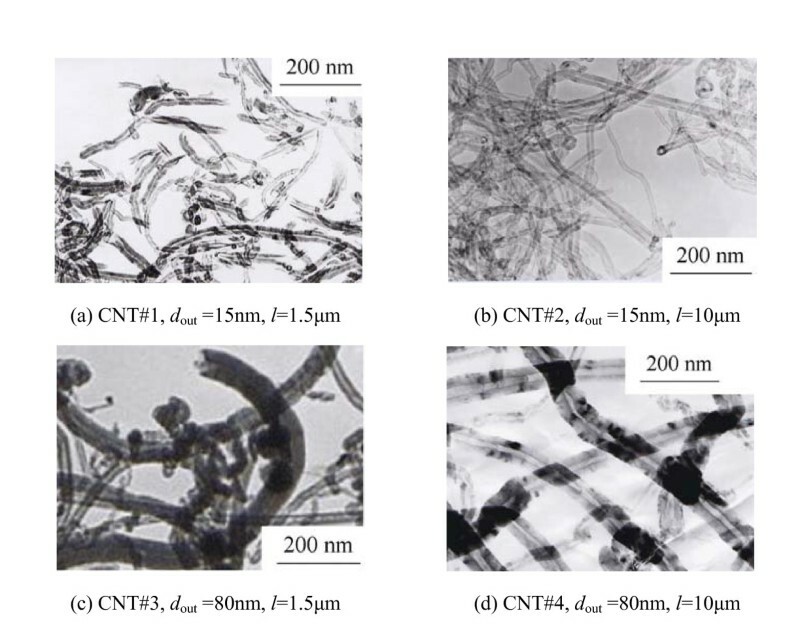 Four types of carbon nanotubes with the outside diameters from 15 to 80 nm and the lengths from 1.5 to 10 μm were used in the experiments. The refrigerants include R113, R141b and n-pentane. The oil concentration is from 0 to 10 wt.%, the heat flux is from 10 to 100 kW·m-2, and the initial liquid-level height is from 1.3 to 3.4 cm. The experimental results indicate that the migration ratio of carbon nanotube increases with the increase of the outside diameter or the length of carbon nanotube. For the fixed type of carbon nanotube, the migration ratio decreases with the increase of the oil concentration or the heat flux, and increases with the increase of the initial liquid-level height. The migration ratio of carbon nanotube increases with the decrease of dynamic viscosity of refrigerant or the increase of liquid phase density of refrigerant. A model for predicting the migration ratio of carbon nanotubes in the refrigerant-based nanofluid pool boiling is proposed, and the predictions agree with 92% of the experimental data within a deviation of ±20%. Nowadays, the researchers show great interest in the possible application of refrigerant-based nanofluids (i.e., the mixtures of nanopowders and conventional pure refrigerants) for improving the performance of refrigeration systems. The researches showed that the refrigerant-based nanofluids have higher thermal conductivity than those of conventional pure refrigerants , the addition of nanoparticles enhances the solubility of mineral oil in HFC refrigerant , and the addition of nanoparticles can save energy consumption of air-conditioner and refrigerator [3, 4]. Comparing with the spherical metal or metal oxide nanoparticles used in these researches, carbon nanotubes (CNTs) have one or two orders of magnitude higher in thermal conductivity, and CNTs can significantly enhance the thermal conductivity of base fluid [5–8] as well as the convective heat transfer coefficient of base fluid , so CNTs have great potential for improving the performance of refrigeration systems. For applying CNTs in refrigeration systems, the phase-change heat transfer characteristics of refrigerant-CNT nanofluid and the cycle behavior of CNTs in refrigeration systems should be known. 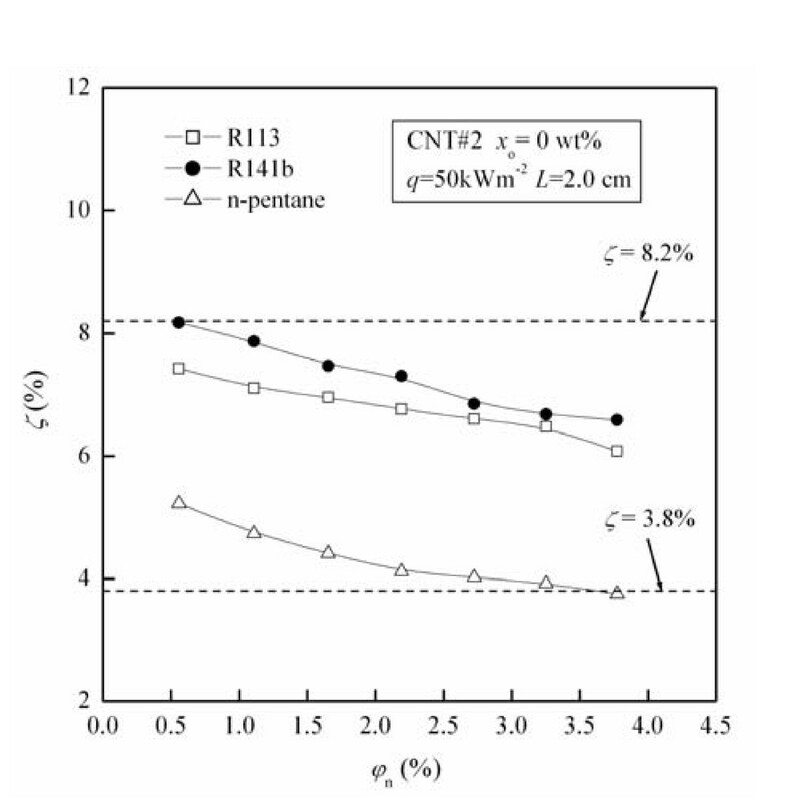 The migration of CNTs from liquid phase to vapor phase in the pool boiling process of refrigerant-CNT nanofluid determines the distribution of CNTs concentration in the liquid phase and vapor phase, and then has significant effect on the phase-change heat transfer characteristics of refrigerant-CNT nanofluid as well as the cycle behavior of CNTs. Therefore, in order to evaluate the phase-change heat transfer characteristics of refrigerant-CNT nanofluid and the cycle behavior of CNTs, the migration of CNTs in the pool boiling process of refrigerant-CNT nanofluid should be researched. The migration of CNTs from liquid phase to vapor phase in the refrigerant-based nanofluid pool boiling can be divided to the following four physical processes: (1) the departure of bubble from the heating surface, (2) the movement of bubble and CNTs in the liquid phase, (3) the capture of CNTs by bubble, and (4) the escape of CNTs from the liquid-vapor interface. From the above analysis, it can be seen that the interaction between CNTs and bubble is the key factor causing the migration of CNTs from liquid phase to vapor phase. The existing flotation theory can accurately describe the interaction between particles and bubbles. However, they can not directly used to predict the migration of CNTs from liquid phase to vapor phase during pool boiling because they are aimed at the conditions without phase change. The present investigation is beneficial to reveal the mass transfer mechanism of nano-scale solid powders from liquid phase to vapor phase during the phase-change process of fluid, and provides the theoretical basis for evaluating the phase-change heat transfer characteristics of refrigerant-CNT nanofluid and the cycle behavior of CNTs. Until now, there is no published research on the migration characteristics of CNTs in the pool boiling of refrigerant-based nanofluid. The migration characteristics of nanopowders are mentioned only by the paper of Ding et al. , and are focused on one type of spherical nanoparticle (CuO). In the paper, the authors found that the migrated mass of CuO nanoparticles in the pool boiling increases with the increase of the original mass of nanoparticles or the original mass of refrigerant. As the structure and the thermophysical properties of CNTs are different from those of spherical nanoparticles, the migration characteristics of CNTs in the pool boiling of refrigerant-based nanofluid may be different from those of spherical nanoparticles, and should be investigated. The existing researches on the pool boiling heat transfer characteristics of nanofluids containing CNTs can be divided into three categories as follows: (1) Pool boiling heat transfer of water-CNTs nanofluids. 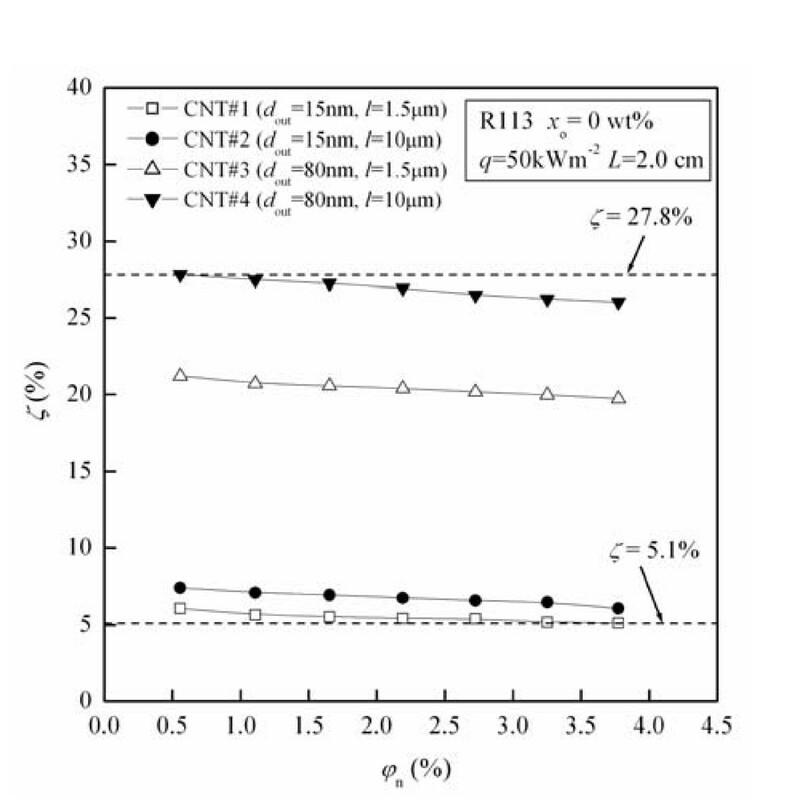 The experimental results showed that CNTs can enhance the pool boiling heat transfer of water [11–13] or deteriorate the pool boiling heat transfer of water , and the influence of CNTs on the pool boiling is related to CNTs concentration . (2) Pool boiling heat transfer of pure refrigerant-CNTs nanofluids. The experiments by Park and Jung [11, 15] showed that CNTs can enhance the pool boiling heat transfer of pure refrigerants (R22, R123, and R134a), and the enhancement is related to the heat flux. (3) Pool boiling heat transfer of refrigerant-oil mixtures with CNTs. Experiments by Peng et al. showed that CNTs can enhance the pool boiling heat transfer of refrigerant-oil mixtures, and the enhancement increases with the decrease of CNTs' outside diameter or CNTs' nanolubricant mass fraction, while increases with the increase of CNTs' length or CNTs' mass fraction in the CNTs' nanolubricant. From the above researches, it can be seen that the CNTs physical dimension (i.e., the outside diameter and the length of CNTs), refrigerant type, CNTs concentration, oil concentration, and heat flux have influences on the pool boiling heat transfer of refrigerant-based nanofluid. Therefore, the influences of the above factors on the migration characteristics of CNTs need be concerned. In addition, the initial liquid-level height affects the pool boiling heat transfer, so the influence of initial liquid-level height on the migration characteristics of CNTs also needs be concerned. 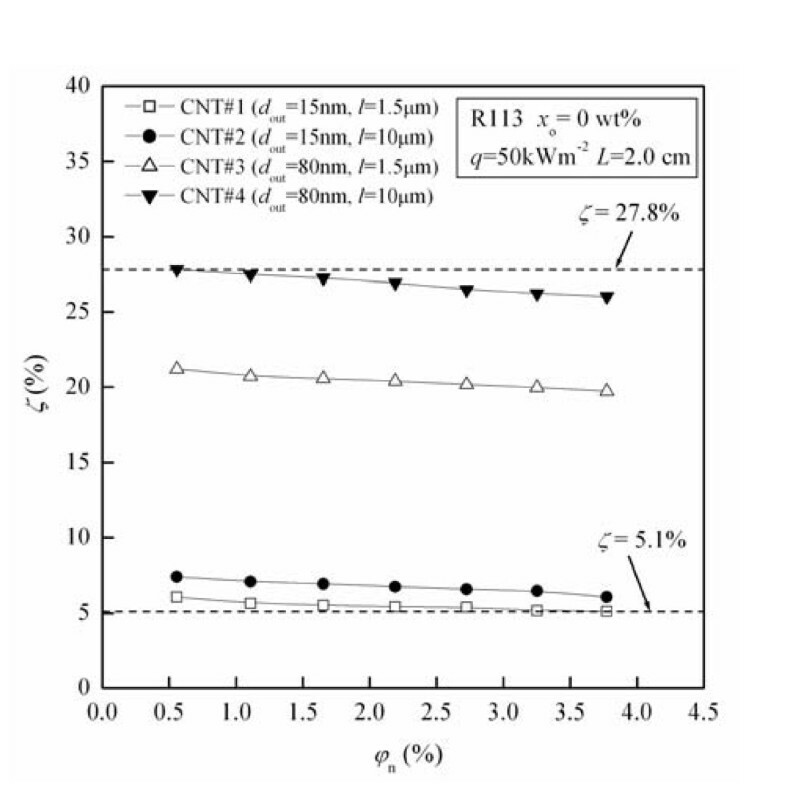 The objective of this paper is to experimentally investigate the influences of CNTs physical dimension, refrigerant type, oil concentration, heat flux, and initial liquid-level height on the migration characteristics of CNTs in the refrigerant-based nanofluid pool boiling at different original CNTs concentrations, and to propose a model for predicting the migration ratio of CNTs in the refrigerant-based nanofluid pool boiling. Test conditions are divided into five categories, as tabulated in Table 1. The objective of category 1 is to investigate the influences of CNTs physical dimension on the migration characteristics of CNTs. Four types of CNTs with different physical dimensions (numbered as CNT#1, CNT#2, CNT#3, and CNT#4) produced by the chemical vapor deposition method are used in these test conditions. The physical dimensions of these four types of CNTs are shown in Table 2 and the TEM (transmission electron microscope) photographs of the CNTs are shown in Figure 1. In these test conditions, the other influence factors including the refrigerant type, oil concentration, heat flux and initial liquid-level height are fixed. TEM photographs of CNTs. (a) CNT#1; (b) CNT#2; (c) CNT#3; (d) CNT#4. The objective of category 2 is to investigate the influences of refrigerant type on the migration characteristics of CNTs. Three types of refrigerants including R113, R141b, and n-pentane are used in these test conditions, belonging to CFC refrigerant, HCFC refrigerant, and alkane refrigerant, respectively. The reasons for choosing these three types of refrigerants are as follows: (1) R113, R141b and n-pentane are in liquid state at room temperature and atmospheric pressure while the widely used refrigerants (e.g., R410A) are in vapor state, so it is much easier to prepare refrigerant-based nanofluids based on R113, R141b, or n-pentane. (2) These three types of refrigerants have different chemical and thermophysical properties including molecular mass, density, dynamic viscosity, etc. The properties of these three refrigerants are given in Table 3. In these test conditions, the other influence factors including the CNTs physical dimension, oil concentration, heat flux and initial liquid-level height are fixed. The objective of category 3 is to investigate the influences of oil concentration on the migration characteristics of CNTs. The lubricating oil RB68EP is used in the experiments. RB68EP is an ester oil with a density of 0.964 g·cm-3 at 15°C and kinematic viscosities of 66.79 and 8.23 mm2·s-1 at 40°C and 100°C, respectively, as reported by the manufacturer. The oil concentration is from 0 to 10 wt.%, covering the oil concentration in the actual refrigeration system. In these test conditions, the other influence factors including the CNTs physical dimension, refrigerant type, heat flux and initial liquid-level height are fixed. The objective of category 4 is to investigate the influences of heat flux on the migration characteristics of CNTs. The heat flux is from 10 to 100 kW·m-2, covering the heat flux in the actual refrigeration system. In these test conditions, the other influence factors including the CNTs physical dimension, refrigerant type, oil concentration and initial liquid-level height are fixed. The objective of category 5 is to investigate the influences of initial liquid-level height on the migration characteristics of CNTs. The initial liquid-level height is from 1.3 to 3.4 cm. In these test conditions, the other influence factors including the CNTs physical dimension, refrigerant type, oil concentration, and heat flux are fixed. 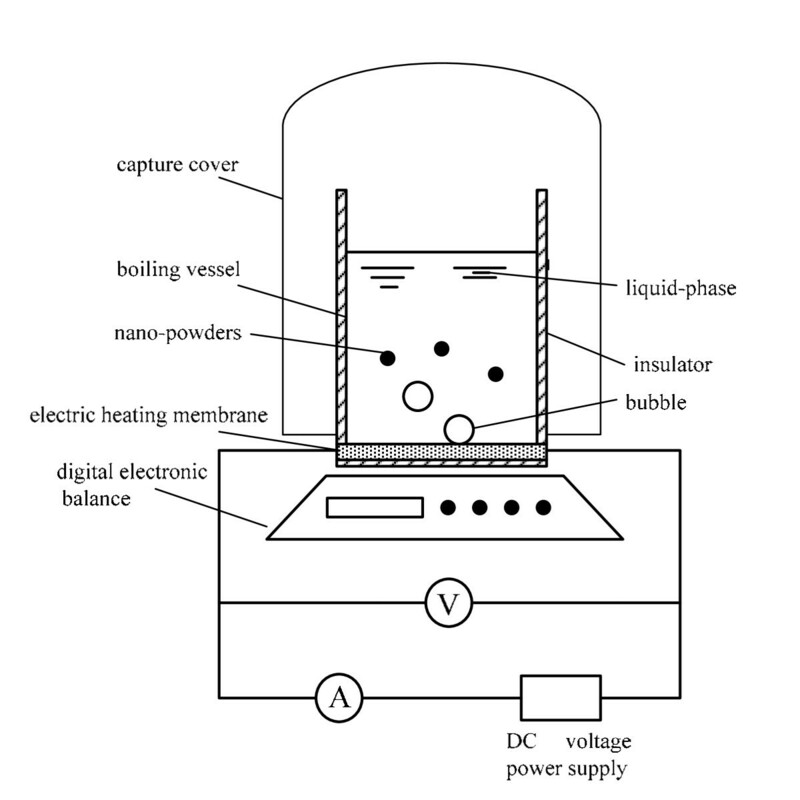 The experimental apparatus used for testing the migration characteristics of CNTs in the refrigerant-based nanofluid pool boiling mainly consists of a pool boiling device, a capture cover and a digital electronic balance, as schematically shown in Figure 2. The pool boiling device mainly consists of a boiling vessel and an electric heating membrane. The boiling vessel is a cylindrical glass container with the inside diameter of 50 mm and the height of 95 mm. The vessel is insulated with glass fibers to reduce heat loss to the surroundings. The electric heating membrane is connected with the direct-current voltage power supply. The ampere meter with the calibrated precision of 0.5% is used for reading electric current supplied to the heating surface, and a data acquisition system with the calibrated precision of 0.002% is used to measure the voltage across the heating surface. The heat flux through the heating surface is controlled by adjusting the heating power of the plate heater, and is calculated by the measured electric current, voltage, and heating surface area. The uncertainty of heat flux is estimated to be smaller than 1.2%. The capture cover is used to collect the CNTs spouted to the environment. The measurement range of the digital electronic balance is from 10.0 mg to 210.0000 g, and the maximum error is 0.1 mg. All the experiments are performed at atmospheric pressure (101.3 kPa) by venting the boiling vessel to ambient. Schematic diagram of experimental apparatus. The objective of the measurements is to get the migrated mass of CNTs from liquid phase to vapor phase in the refrigerant-based nanofluid pool boiling. Ding et al. have proposed the weighing method to obtain the migrated mass of spherical nanoparticles, and this method is also used in the present study to get the migrated mass of CNTs. The experimental procedure for the refrigerant-based nanofluid without oil consists of the following steps: (1) adding CNTs with the original mass of mn0 to the boiling vessel; (2) weighing the total mass of the boiling vessel and the CNTs, m1; (3) adding refrigerant with the original mass of mr0 to the boiling vessel; (4) opening the direct-current voltage power supply and heating the refrigerant-based nanofluid to be boiling; (5) adjusting the voltage to control the heat flux; (6) weighing the total mass of the boiling vessel and the CNTs, m2, when the refrigerant is entirely evaporated (the signal for the entire evaporation is that the mass of mixture does not change for 12 h); (7) calculating the migrated mass of CNTs with the equation Δmn = m1 - m2. The experimental procedure for the refrigerant-based nanofluid with oil consists of the following steps: (1) adding CNTs with the original mass of mn0 and oil with the mass of mo to the boiling vessel; (2) weighing the total mass of the boiling vessel, the CNTs and oil, m3; (3) adding refrigerant with the original mass of mr0 to the boiling vessel; (4) opening the direct-current voltage power supply and heating the refrigerant-based nanofluid with lubricating oil to be boiling; (5) adjusting the voltage to control the heat flux; (6) weighing the total mass of the boiling vessel, the CNTs and oil, m4, when the refrigerant is entirely evaporated (the signal for the entire evaporation is that the mass of mixture does not change for 12 h); (7) calculating the migrated mass of CNTs with the equation Δmn = m3 - m4. where, Δmn is the migrated mass of CNTs, and mn0 is the original mass of CNTs. where, mr0, mo are the original mass of refrigerant and the mass of oil, respectively; ρn, ρr, L, ρo are the density of CNTs, liquid-phase refrigerant and oil, respectively. Determined by the accuracy of the digital electronic balance, the maximum uncertainties of the measured migrated mass of CNTs (δ Δmn) and original mass of CNTs (δm0) are 0.2 mg and 0.1 mg, respectively. The maximum relative uncertainty of migration ratio of CNTs is obtained at the condition of the smallest migrated mass of CNTs and the migrated mass of CNTs, and calculated to be 2.5%. Tests under several conditions were repeated for three times, and it shows that the differences among the three testing results under each condition are less than 3%. Therefore, the experimental results are reproducible. 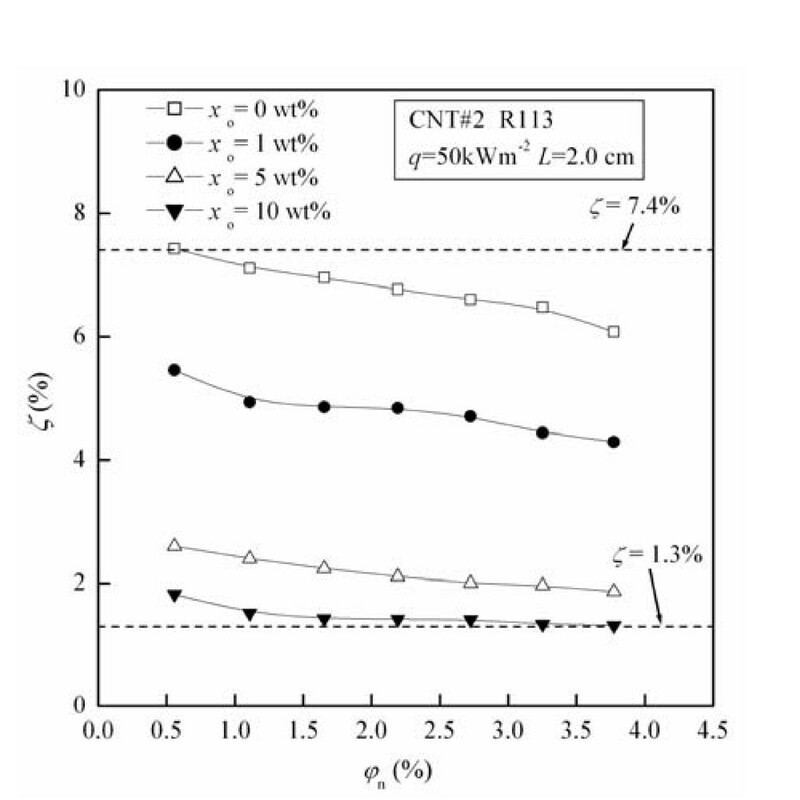 Figure 3 shows the migration ratio (ζ) of CNTs as a function of original CNTs concentration (φn) for CNTs with different physical dimensions. The values of ζ under these test conditions are in the range of 5.1% to approximately 27.8%. For fixed CNTs physical dimension, ζ decreases with the increase of φn. For example, ζ for CNT#1 decreases by 15.8% with the increase of φn from 0.56 to 3.77 vol.%. Influence of CNTs physical dimension on the migration ratio of CNTs. 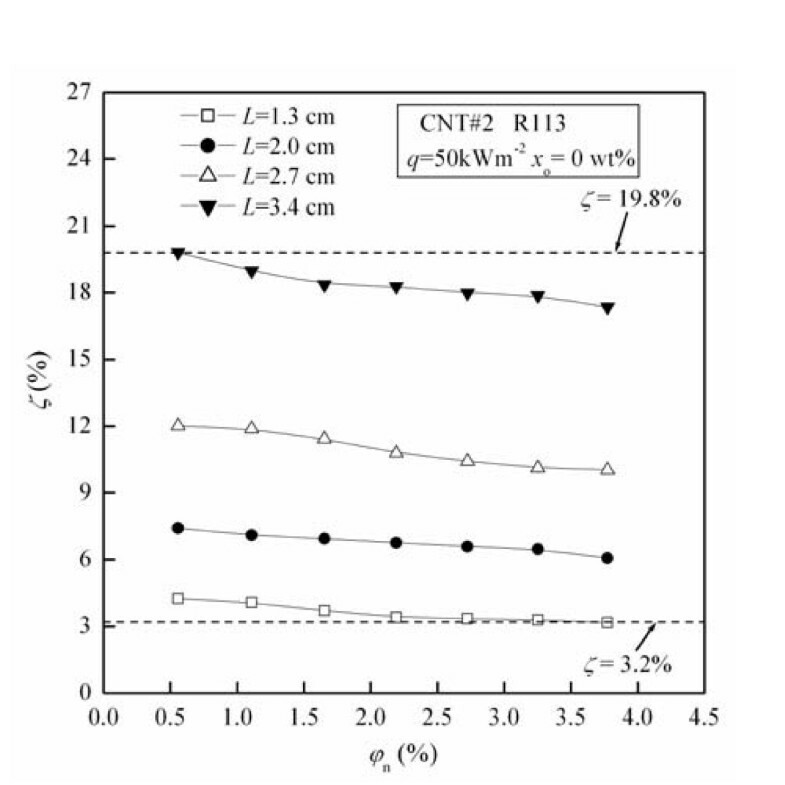 From Figure 3 it can be seen that the migration ratio (ζ) of CNTs increases with the increase of the outside diameter of CNTs (dout) when the length of CNTs (l) is fixed. For example, at the condition of l = 1.5 μm, the value of ζ increases by maximally 286.4% with the increase of dout from 15 to 80 nm. 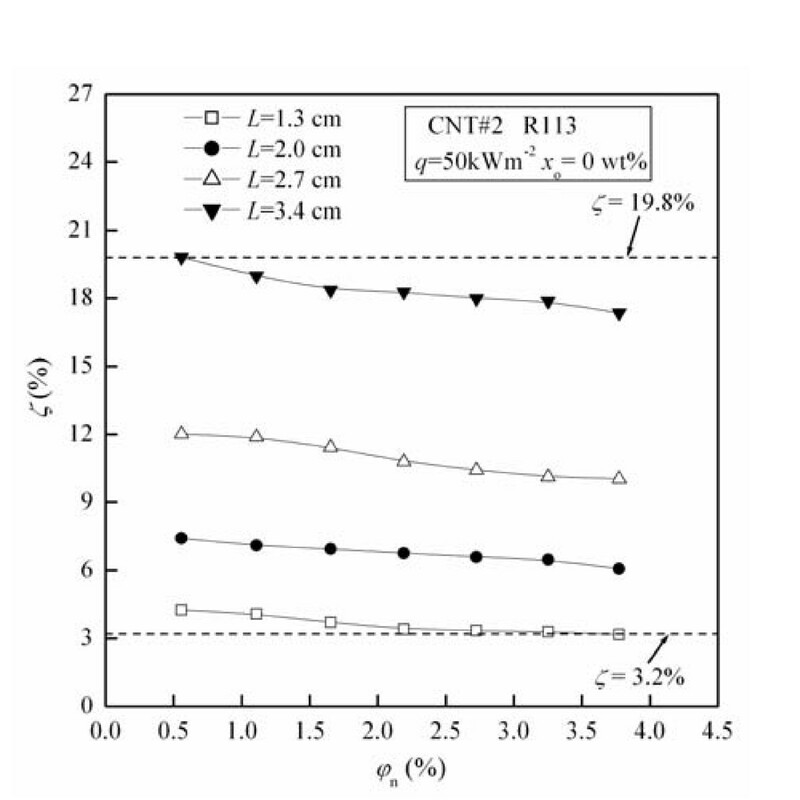 It also can be seen from Figure 3 that the migration ratio (ζ) of CNTs increases with the increase of the length of CNTs (l) when the outside diameter of CNTs (dout) is fixed. For example, at the condition of dout = 15 nm, the value of ζ increases by maximally 25.7% with the increase of l from 1.5 to 10 μm. The possible reasons for the above phenomenon are as follows: The capture of CNTs by the bubbles generated in the pool boiling leads to the migration of CNTs. Brownian diffusion, interception, gravity settling and inertial impaction are four mechanisms for the capture of particles by bubbles . As the CNTs do not exhibit Brownian motion due to their high aspect ratio [18, 19], the capture efficiency of CNTs by bubbles can be considered as the sum of the capture efficiencies caused by interception, gravity settling, and inertial impaction. Each of the above three captured efficiencies increases with Stokes diameter of CNTs. The increase of the outside diameter or the length of CNTs causes the increase of Stokes diameter of CNTs , thus the captured efficiency of CNTs by bubbles increases, which leads to the migration ratio (ζ) of CNTs increasing with increase of the outside diameter or the length of CNTs. Figure 4 shows the migration ratio (ζ) of CNTs as a function of original CNTs concentration (φn) for different types of refrigerants. The values of ζ under these test conditions are in the range of 3.8% to approximately 8.2%. For fixed refrigerant type, ζ decreases with the increase of φn. For example, ζ for R141b decreases by 19.5% with the increase of φn from 0.56 to 3.77 vol.%. Influence of refrigerant type on the migration ratio of CNTs. From Figure 4 it can be seen that the migration ratio (ζ) of CNTs are in the order of R141b > R113 > n-pentane, the value of ζ in the R141b-based nanofluid is by maximally 10.7% larger than that in the R113-based nanofluid, and is by maximally 77.4% larger than that in n-pentane-based nanofluid. The possible reasons for the above phenomenon are as follows: (1) The dynamic viscosity values for these three refrigerants are in the order of R113 (5 × 10-4 Pa·s) > R141b (3.78 × 10-4 Pa·s) > n-pentane (1.91 × 10-4 Pa·s). The larger dynamic viscosity causes the smaller capture efficiencies caused by gravity settling and inertial impaction, which leads to the smaller migration ratio of CNTs. (2) The liquid-phase density values of for these three refrigerants are in the order of R113 (1,508 kg·m-3) > R141b (1,220 kg·m-3) > n-pentane (606 kg·m-3). The larger liquid-phase density means the larger mass of liquid-phase refrigerant at fixed liquid-level height, thus the amount of bubbles generated in the pool boiling is larger, which leads to the larger migration ratio of CNTs. The influence of refrigerant type on the migration ratio of CNTs is determined by the conjunct role of the above two aspects, and follows the order of R141b > R113 > n-pentane. It can be concluded that the migration ratio of carbon nanotube increases with the decrease of dynamic viscosity of refrigerant or the increase of liquid-phase density of refrigerant. Figure 5 shows the migration ratio (ζ) of CNTs as a function of original CNTs concentration (φn) for different oil concentrations (xo). The values of ζ under these test conditions are in the range of 1.3% to approximately 7.4%. For fixed xo, ζ decreases with the increase of φn. For example, at the condition of xo = 5 wt.%, ζ decreases by 28.2% with the increase of φn from 0.56 to 3.77 vol.%. Influence of oil concentration on the migration ratio of CNTs. From Figure 5 it can be seen that the migration ratio (ζ) of CNTs decreases by maximally 70.7% with the increase of oil concentration (xo) from 1 to 10 wt.%. The possible reasons are as follows: (1) The dynamic viscosity and surface tension of lubricating oil RB68EP are larger than those of pure refrigerant, causing the dynamic viscosity and surface tension of liquid-phase refrigerant-oil mixture increase with the increase of xo. (2) The increase of dynamic viscosity of liquid-phase refrigerant-oil mixture results in the decrease of capture efficiencies caused by gravity settling and inertial impaction, which leads to ζ decreasing with the increase of xo. (3) The increase of surface tension of liquid-phase refrigerant-oil mixture causes the increase of bubble departure diameter in the pool boiling, thus the capture efficiencies caused by interception, gravity settling, and inertial impaction decrease, which leads to ζ decreasing with the increase of xo. Figure 6 shows the migration ratio (ζ) of CNTs as a function of original CNTs concentration (φn) for different heat fluxes (q). The values of ζ under these test conditions are in the range of 5.5% to approximately 9.2%. For fixed q, ζ decreases with the increase of φn. For example, at the condition of q = 10 kWm-2, ζ decreases by 21.5% with the increase of φn from 0.56 to 3.77 vol.%. Influence of heat flux on the migration ratio of CNTs. 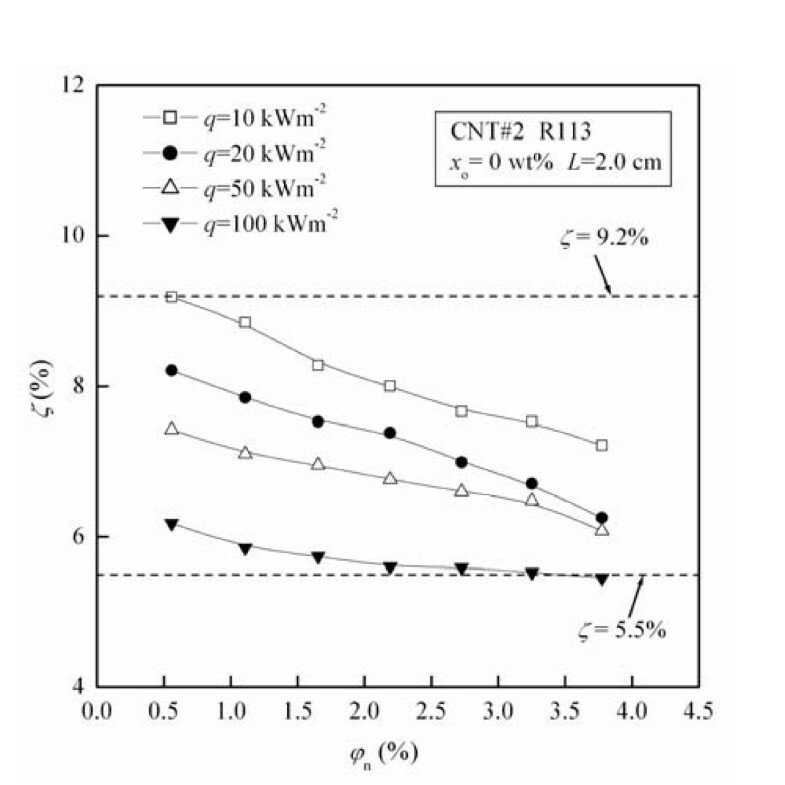 From Figure 6 it can be seen that the migration ratio (ζ) of CNTs decreases by maximally 33.9% with the increase of heat flux (q) from 10 to 100 kWm-2. The possible reasons are as follows: (1) The increase of heat flux causes the increase of the velocity of departure bubble , thus the velocity of rising bubble increases. (2) The increase of velocity of rising bubble results in the decrease of capture efficiency caused by gravity settling, which leads to the decrease of ζ. (3) The increase of velocity of rising bubble results in the increase of capture efficiency caused by inertial impaction, which leads to the increase of ζ. (4) The increase of velocity of rising bubble results in the decrease of the bubble rising time in the liquid phase, causing the decrease of the amount of CNTs captured by bubbles, which leads to the decrease of ζ. The conjunct role of the above aspects leads to the migration ratio of CNTs (ζ) decreasing with the increase of heat flux. Figure 7 shows the migration ratio (ζ) of CNTs as a function of original CNTs concentration (φn) for different initial liquid-level heights (L). The values of ζ under these test conditions are in the range of 3.2% to approximately 19.8%. For fixed L, ζ decreases with the increase of φn. For example, at the condition of L = 2.7 cm, ζ decreases by 16.5% with the increase of φn from 0.56 to 3.77 vol.%. Influence of initial liquid-level height on the migration ratio of CNTs. From Figure 7 it can be seen that the migration ratio (ζ) of CNTs increases by maximally 446.9% with the increase of initial liquid-level height (L) from 1.3 to 3.4 cm. The possible reasons are as follows: (1) The increase of initial liquid-level height causes the increase of the bubble rising time in the liquid phase, thus the amount of CNTs captured by bubbles, which leads to ζ increasing with the increase of liquid-level height. (2) The increase of initial liquid-level height causes the increase of CNTs escape probability on the liquid-vapor interface, which leads to ζ increasing with the increase of liquid-level height. As there is no published literature on the model for predicting the migration ratio of CNTs in the refrigerant-based nanofluid pool boiling, the development of a new model is needed. The CNTs physical dimension, refrigerant type, oil concentration, heat flux, and initial liquid-level height are five important factors influencing the migration of CNTs, and should be reflected in the new model. where, mn,tis the mass of CNTs in the liquid phase at the moment of t; mn0 is the original mass of CNTs. where, K is the migration coefficient of CNTs (i.e., the migration proportion of CNTs caused by single bubble); nb is the number of generated bubbles per unit time. From Eq. 6, the following equation can be obtained. In Eq. 9, Nb is the total number of generated bubbles from the beginning to the end of pool boiling. where, αI, αG, and αIN are the capture efficiencies of CNTs caused by interception, gravity settling, and inertial impaction, respectively; β is the escape probability of CNTs; γ is the CNTs concentration impact factor. αI, αG, αIN, β, and γ are expressed as Eqs. 11 to 15, respectively. In Eqs. 11 to 15, D and H are the bottom diameter and height of boiling vessel, respectively; ρL, ρb, ρn are the density of liquid refrigerant-oil mixture, bubble and CNT, respectively; μL is the dynamic viscosity of liquid refrigerant-oil mixture; ds is the Stokes diameter; db is the diameter of bubble; ub is the bubble rising velocity. The calculation of ρL and mL are presented in -Table 4. In Eqs. 17 and 18, Cp, L, is the isobaric specific heat of liquid refrigerant-oil mixture; σ is the surface tension of refrigerant-oil mixture; Tsat is the saturation temperature; hfg is the latent heat of vaporization. The calculation of Cp, Land σ are presented in -Table 4. As the original mass of refrigerant is equal to the total mass of generated bubbles from the beginning to the end of pool boiling, Nb can be calculated by Eq. 19. The nine coefficients of a1, a2, a3, a4, b1, b2, b3, b4, and b5 in Eqs. 11 to 15 are fitted based on total 105 experimental data in this study. By nonlinear programming solution method, the nine coefficients of a1, a2, a3, a4, b1, b2, b3, b4, and b5 can be determined as 0.1, 6.3 × 10-6, 1,995.3, 66.9, 2.34, 0.4, 2.26, 8.78, and -0.09, respectively. Therefore, the model for predicting the migration ratio of CNTs in the refrigerant-based nanofluid pool boiling is expressed Eq. 20. 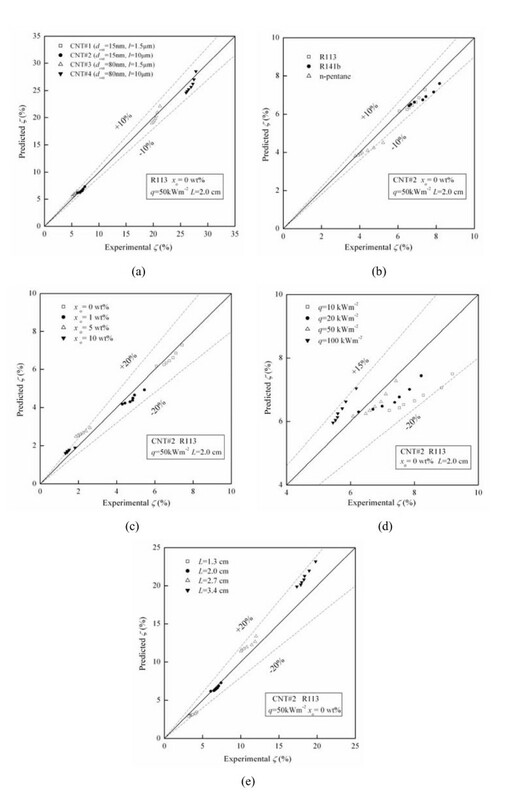 Figure 8a to e shows the comparison between the predicted values of the model with the experimental data for different CNTs physical dimensions, refrigerant types, oil concentrations, heat fluxes, and liquid-level heights, respectively. It can be seen from Figure 8a to e that the migration ratio of CNTs predicted by the model and the experimental data have the same tendency changing with the CNTs physical dimension, refrigerant type, oil concentration, heat flux, or initial liquid-level height. The predicted values of the model agree with 92% of the experimental data of migration ratio of CNTs within a deviation of ± 20%, and the mean deviation is 9.96%. Comparison between the predicted migration ratios of the model with the experimental data. (a) for different CNTs physical dimensions; (b) for different refrigerant types; (c) for different oilconcentrations; (d) for different heat fluxes; (e) for different initial liquid-level heights. Migration characteristics of CNTs from liquid phase to vapor phase in the pool boiling process of refrigerant-based nanofluid are investigated experimentally, and some conclusions are obtained. The migration ratio of CNTs increases with the increase of the outside diameter of CNTs or the length of CNTs. The migration ratio of carbon nanotube increases with the decrease of dynamic viscosity of refrigerant or the increase of liquid-phase density of refrigerant. Under the present experimental conditions, the migration ratio of CNTs in the R141b-based nanofluid is by maximally 10.7% larger than that in the R113-based nanofluid, and is by maximally 77.4% larger than that in n-pentane-based nanofluid. The migration ratio of CNTs decreases with the increase of oil concentration. Under the present experimental conditions, the migration ratio decreases by maximally 70.7% with the increase of oil concentration from 1 to 10 wt.%. The migration ratio of CNTs decreases with the increase of heat flux. Under the present experimental conditions, the migration ratio decreases by maximally 33.9% with the increase of heat flux from 10 to 100 kWm-2. The migration ratio of CNTs increases with the increase of initial liquid-level height. Under the present experimental conditions, the migration ratio increases by maximally 446.9% with the increase of initial liquid-level height from 1.3 to 3.4 cm. A model for predicting the migration ratio of CNTs in the refrigerant-based nanofluid pool boiling is proposed, and the predicted values of the model can agree with 92% of the experimental data of migration ratio of CNTs within a deviation of ± 20%. The authors gratefully acknowledge the support from the National Natural Science Foundation of China (Grant No. 50976065). HP carried out the experimental study and model development. GD participated in the model development and design of the experiments. HH participated in the experimental study. All authors read and approved the final manuscript.